2018 was my year of rebooting my body and building up strength again. I joined a gym halfway through the year and go every second day. Now if you are a gym goer you'll know that after a particularly good workout you can feel quite sore the over the following days! I remembered that when I was a couple of decades younger and was 'gyming it' I would take BCAAs to help reduce and/or stop the soreness. 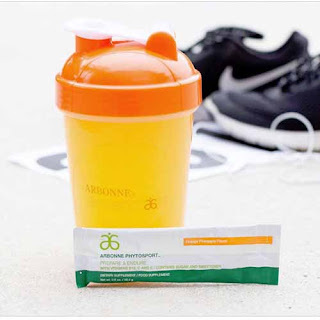 I was really happy when I found that Arbonne had a phytosport range that included their After Workout - guess what one of the ingredients were? BCAAs! I knew this would help and the fact that it's a sachet that you mix with water to make a drink is even better because you need to keep your water intake up. 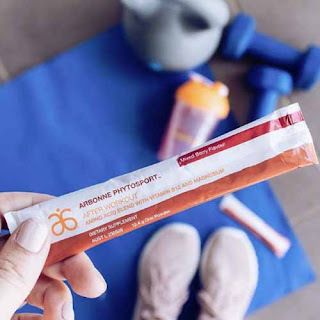 What's in Arbonne's Phytosport After Workout? So what exactly is in this product and how do they help is probably what you're all wondering. Branched-chain amino acids, commonly known as BCAAs are one of the key ingredients. To explain how they work let me tell you what happens when you work your muscles. The muscle fibres actually pull apart, when you stop exercising they have to go back together. It's actually this action which causes people to develop bigger muscles, but the time when they are knitting back together is when you can experience muscle soreness. Where BCAAs come in is that they help the muscles to knit together faster thereby supporting muscle repair while also alleviating muscle soreness. Now a side effect from exercising is that your body produces something called free radicals. Free radicals can cause aging - I once heard someone talk about them with this analagy; if your body was a car free radicals would be the rust! This is why when people exercise a lot they're encouraged to increase the intake of anti-oxidants either through their diet or supplementation. In After Workout there are also anti-oxidants formulated from pomegranate. Also included are calcium, magnesium and vitamin B12. When you buy this supplement it comes in a box full of sachets, you add the contents of one sachet to approximately 500ml of water and mix. The drink is a mixed berry flavor and has a pink color as you can see in this photo of me. 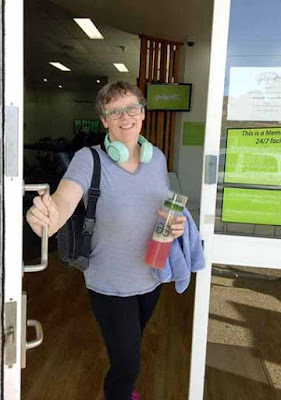 I have just finished my usual circuit PLUS started a running program when this photo was taken so I knew I needed to have something to stop myself feeling sore the next day! It even tastes nice, which is true of all three of the Phytosports range (yes I use all of them!). What Isn't In Phytosport After Workout? Sometimes what makes a product great is just as much about what isn't in it as what is in it! This sports drink is certified vegan and also has the BSCG certified drug free stamp of approval. All of Arbonne's products are also gluten-free. The After Workout contains no artificial colours, flavours or sweeteners.